Summary: Thinking of developing a youth program? Looking for creative ideas to recruit more young writers to your summer camp offerings? If so, then this blog post describing an exciting one-day free youth event the Chippewa River Writing Project (CRWP) hosted could be the spark you need. This collaboration between the CRWP and the NCTE student affiliate at Central Michigan University is a model for 1) creatively engaging young writers K-8, 2) partnering with like minded campus partners, 3) providing outreach and opportunities with short, yet meaningful programming, and 4) how an outreach efforts can also serve as a great marketing tool/opportunity. The auditorium in Anspach Hall was buzzing on the morning of Saturday, April 25th, as 30 excited young authors from area schools grabbed their pencils and notebooks to kick off the first annual Manuscript Day. The event — co-hosted by the Chippewa River Writing Project (CRWP) and the student affiliate of the National Council of Teachers of English (NCTE) at Central Michigan University — was free for the elementary and middle school students in attendance. “I already started a story. It’s fan fiction about TMNT!” exclaimed third grader Frances. Fellow third grader Hailee pulled out four new writer’s notebooks that she had brought with her “just in case,” and Paige was excited to write about Girl Scouts. CRWP Director Troy Hicks kicked off the event with writing into the day inspired by the video, “Guide to Being Awesome,” from Kid President. “Are you ready to write?” Hicks asked. “How are you going to be awesome today?” The young writers cheered in response. 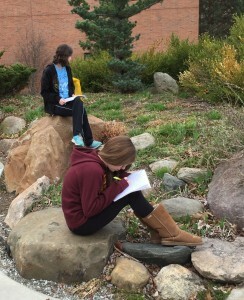 Young authors use their senses as they write outdoors near CMU’s greenhouse. The elementary students attending Manuscript Day were scheduled for three different sessions, each led by a CRWP Teacher Consultant and CMU pre-service teachers. Marcia Larkins, a 2011 CRWP TC and fifth grade teacher in Carson City, launched the writing marathon session by reminding students, “You can write about anything, anywhere, anytime. Just look around.” Students were encouraged to find inspiration through their senses as they traveled around campus to write. CMU pre-service teacher Ethan O’Brien, himself a songwriter and musician from Alpena, recommended that the marathon participants write without limitations. “Get the goop off your brain first…The good stuff will come even if it doesn’t come right away.” Once outside, the students could use all of their senses in their writing. Blossoming tulips were personified in narratives; chirping birds became raptors on a deserted island; the smells of pine and cedar drifted into story. CMU students Jacob Leski, Nicole Samuel and Liliana Cujar assist CRWP TC Julie O’Brien in What a Character! Jacob Leski, a CMU pre-service teacher from Okemos, invited fifth-grader Dean to join him in a skit about Ralph, the picky customer, in order to demonstrate the power of dialogue in establishing a character. Hands went up as more and more students asked to use sock puppets, wear princess dresses, try on jewelry, and act out improv scenes. After each scene, the writers noticed how characters might be developed by descriptions, facial expressions, dialogue, situation, and, best of all, unbridled imagination. After the skits, students broke into pairs to write their own characters using all they had learned from improvising. 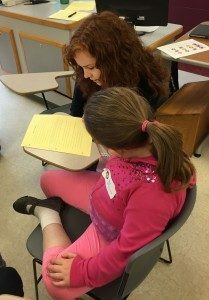 CMU pre-service teacher Emily Stoddard helps a young writer remake a fairy tale. While the elementary students moved between three sessions in the morning, the middle school students stayed in one spot — one of the three computer labs in Anspach Hall — in order to dive deeper into the crafts of writing and digital literacy. CRWP Co-Director Jeremy Hyler introduced students to Mozilla’s X-Ray Goggles, a program that allows students to view the code on any web page and then “hack” the page to create their own version. The writers decided to put a positive spin or insert their own voices into news stories of their choosing. Hyler commented that writing is not just putting pen to paper anymore; students can participate in a global conversation using tools like Mozilla’s to remix and remake their writing and the writings of others. These older students had a thing or two to teach the adults as well. CMU pre-service teacher Tyler Judd from Grosse Ile, looked over the shoulder of a middle school student as she showed him Google Gravity and Google Antigravity as tools for remixing the ordinary Google search into something visual and powerful. 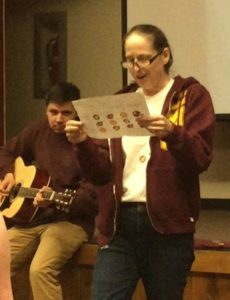 CRWP TC Marcia Larkins and CMU student Ethan O’Brien perform a writing rap. The first annual Manuscript Day reminded authors, young and old alike, of the need to try fresh approaches and to throw off limitations as we strive to be more creative in our craft. Students in grades three through eight can continue to be inspired by attending one of the CRWP’s writing camps at CMU this summer. A camp for elementary students (grade three through five) will be held in Anspach Hall, June 15th-18th. Likewise, a summer camp for sixth through eighth graders will be held the same week. For more information on both camps, please visit our “Youth” page on the CRWP website. The CRWP wishes to express its appreciation to the pre-service teachers from Central Michigan University’s student chapter of NCTE who volunteered their Saturday morning to work with students and share their love of writing.